Akron Children’s Hospital Mahoning Valley received a $25,000 grant from The Youngstown Foundation to help fund renovation costs associated with the opening of our pediatric surgery center at the Beeghly campus in Boardman. The renovated 14,000-square-foot facility provides modern surgical suites, a sterile processing center, and an 8-bed post-anesthesia care unit. The surgical team includes pediatric anesthesiologists, specialty surgeons, nurses, surgical technicians and a child life specialist, all of whom understand the unique medical needs and concerns of children and their families. 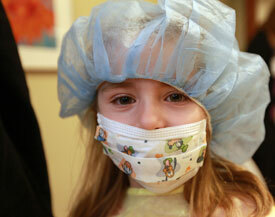 Akron Children’s Hospital performs more pediatric surgeries than any other hospital in Northeast Ohio. Since opening in October 2010, more than 155 surgical cases have been performed at the new facility.